Suede is a type of brushed leather often used for making purses, jackets, seasonal garments, and upholstered items. You can get regular sueded leather hides for sewing or you can get synthetic microfiber fabric that provides the look and feel of true suede. Sewing suede is a lot like sewing leather, but suede has a nap that leather doesn't have. So, when cutting out the suede, you need to make sure all the pieces are cut so the nap will go in the same direction. Avoid using pins in sueded leather because the pin holes will be permanent. The holes won't show at first. but as the item begins to show wear, pinholes can turn to weak spots. Pattern weights work just as well and take the pinholing problem out of the equation. Use basting tape to keep pieces from separating and sliding apart when sewing. Hand basting also works, but be sure to keep stitches close to the cut edge of the suede if hand basting. 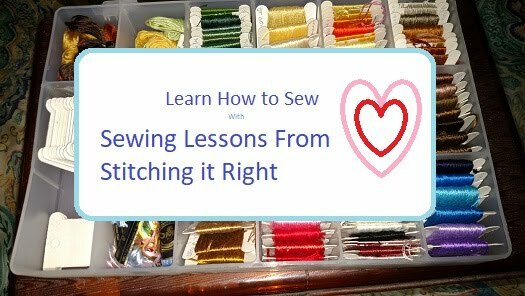 Set the sewing machine to make long stitches and use a sharp 10 gauge needle. Thanks for reading, and if you have any questions or concerns about sewing suede that I didn't cover in this short list of tips for sewing suede, leave a comment and I'll get back to you with an answer. If you are going to sew leather on a machine, it's best to have an industrial sewing machine, but that does not mean a regular household sewing won't work - quite the contrary. If you set a regular sewing machine up with the right type of needle and adjust the presser foot tension, you can use it to sew leather. This will be a medium to large gauge needle with a fairly large eye to acccomodate the heavy thread needed, and it will have a sharp point to pierce the leather hide without tearing larger holes. Put thick cotton or cotton blend thread on the sewing machine and in the bobbin. Lightweight thread might sew through the leather hide, but it is not likely to hold up properly when using the leather item you're making. If you've already been sewing something thick, your presser foot tension should be fine, but if you've been working with delicate fabric, you might need to adjust the tension on your sewing machine's presser foot. The key is to remember that presser foot tension needs to be the opposite of your fabric. Heavy fabric, such as leather or denim, means light presser foot tension, while light fabric means you need heavy presser foot tension. I won't try to tell you how to set this tension - only because each sewing machine is different - but the adjustment is typically made directly above the presser foot on top of the sewing machine's body - so check your manual, and if you can't find the info, ask and I'll see if I have or can find the details for your specific machine for you..